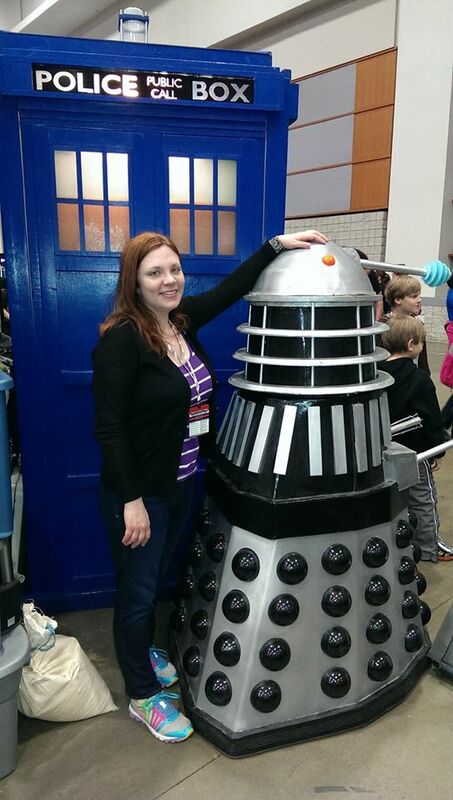 Look, it’s me with a Dalek. Exterminate, exterminate! 1) My name is Beth Woodward. I live just outside of Washington, DC. I am a Virgo. My favorite color is blue or purple, depending on the day. 2) I write fantasy and science fiction. My first novel, The Demon Within, is scheduled to be published by California Coldblood Books late next year. It’s about a woman who discovers that she’s half demon. Craziness ensues. I’m working on a nice, pithy description for the “Books” page now. The Demon Within will be the first in a four-book series. 4) I read all the time. I never go anywhere without my Kindle. Some books I really like. Some books…not so much. But I am probably only going to talk about books I like on here. It’s just a personal philosophy thing. Once upon a time, I was the Book Editor for a pop culture website called . At the time, I wrote some negative reviews. But as I spent more time reviewing books, I realized I liked writing them less and less. Plus, I know how difficult it can be to write a book, and I don’t want to use my website as a platform to tear other people’s book’s down. If I’m going to spend a blog entry talking about a book, I’d much rather build up a book I loved than tear down one I hated. 4) About a year ago, I became hooked on “Doctor Who.” (One day, I’ll probably write the story of how and why I became hooked on the Doctor, but that is a different story for a different day.) I will probably talk about it. Often. David Tennant is my favorite Doctor, though I still have a soft spot for Christopher Eccleston and wish he had stuck around longer (and come back for the 50th anniversary special *sad face*). 5) I love going to sci-fi/fantasy convenientions, Renaissance fairs, weird museums, and any places that are a little offbeat and kooky. I’m basically a big nerd. 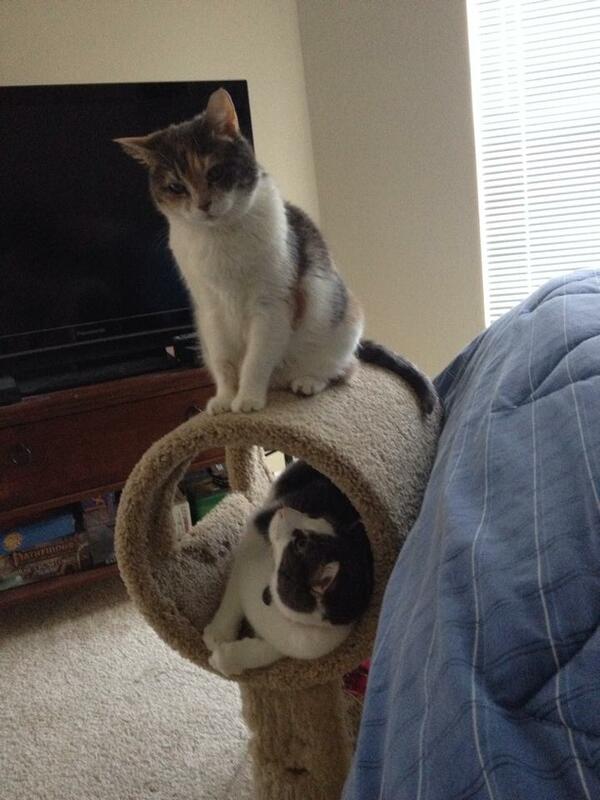 6) I have two cats, Annabel and Shay. Annabel is a 10-year-old dilute calico who is warm, affectionate, and cuddly. Shay is a two-year-old, male, black-and-white cat who wants to play and eat all the time. He’s kooky and friendly and afraid of the refrigerator repair man. I love them both. Yes, I’m a crazy cat lady, and I’m okay with that. I’ll try not to talk about them *too* often. 7) I love colorful things. My favorite shoes are a pair of sneakers that have every color of the rainbow on them (and a few that aren’t). I call them my Punky Brewster shoes. Basically, if it looks like a Crayola box threw up on it, I love it. 8) I tend to write dark stories. I was influenced a lot by horror stories and all the true ghost/paranormal/crime shows I consumed growing up. But what’s funny is when people come up to me and say, “You don’t look like you’d write stories like that.” As if to have an inner darkness that I tap into while I’m writing, I should dress like Morticia Addams and paint my fingernails in blood. Instead, I’m a blue-eyed redhead, and I dress like a college student most of the time. But the truth is, I get a kick out of defying people’s expectations. 9) I gave up soda about five months ago. Now, I drink way too many mocha frappucinos to get my caffeine fix. From one poision to another. 10) I have trouble coming up with ten interesting things to say about myself. So there you have it, folks. Welcome to my blog!